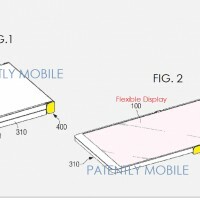 We heard some rumors about a foldable smartphone from Samsung, but now it's time for a more behind-the-scenes look at things. A patent filed in the latter half of 2014 shows just how such a smartphone can be constructed (it's one of several patent applications). 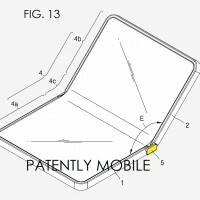 The foldable screen is the key and from the patent illustrations it seems that it will sit on top of a textile-like material. 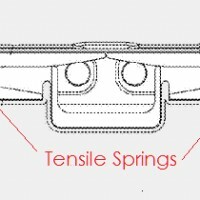 Tensile springs along with some additional mechanisms keep the bendy screen taut when the clamshell is open. The central hinge is an important part of that too. 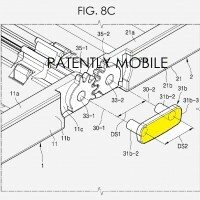 The other patent application shows that the device may be opened in a laptop-like configuration, instead of opened flat. This design looks like it uses a different hinge mechanism and an "elastic unit" to keep the screen taut. 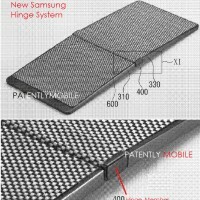 So, Samsung is exploring several avenues – the first one seems aimed at clamshell smartphones, while the other can make tablets that bend into a laptop position. Here's a 3D render from a patent filed in Korea that shows what such a device might look like. 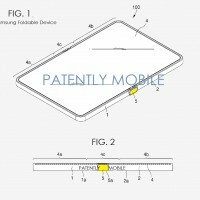 The patents are from a year ago, the actual devices are expected as early as January, if rumors are to be believed.